Smt. 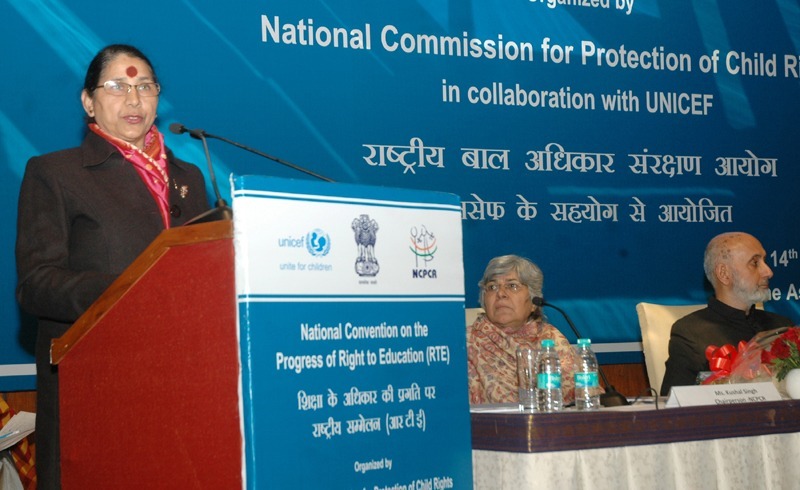 Krishna Tirath, Minister for Women & Child Development inaugurated a two-day National Convention on 'Three Years of Completion of the RTE Act" in New Delhi today. Inaugurating the Convention Smt. Tirath said that the onus is on the Government to provide and ensure free and elementary education to all children in the age group of 6 to 14 years. She further added that the National Commission for Protection of Child Rights (NCPCR) and SCPCRs should monitor out-of-school children to facilitate their access and participation in the schooling system. This would include children who have never enrolled or have dropped out, children who are temporarily absent, and children who are permanent migrants or who migrate seasonally with their parents. Speaking on the occasion, Shri R. Bhattacharya, Secretary, Education and Literacy said that considerable progress has been made by the states and UTs with regard to meeting the standards given in the schedule of the RTE Act. He further said that most eligible habitations in the country are being provided with neighborhood schools, residential schools and transportation facilities to provide access to elementary education. He further went on to state that 98% of the habitation in this country have elementary schools within 1 km and 92% have upper primary schools within 3 km of their locations. Welcoming the delegates, Chairperson NCPCR Ms. Kushal Singh urged all the participants to come out with constructive ideas and participate in the discussions to make the Convention meaningful and successful. Mr. Louis-Georges Arsenault, Country Representative, UNICEF and Dr. Narendra Jadhav, Member, Planning Commission also spoke on the occasion. This Convention has been jointly organized by National Commission for Protection of Child Rights (NCPCR) and UNICEF. Around 300 participants associated with the implementation of RTE Act and other stakeholders from across the Country are attending the Convention.